Watches are very important tools for nurses as they provide the valuable assistance necessary to complete work-related tasks. For instance, nurses will need a timepiece to check a patient’s vitals such as the respiratory and pulse rates. They are also very important to scheduling and making sure that patients under their care are taking their meds at the right time. But there are watches that are better suited than others when it comes to assisting nurses in their daily activities. However, with the number of available watches on the market, going through everything just to buy a single timepiece is too much. 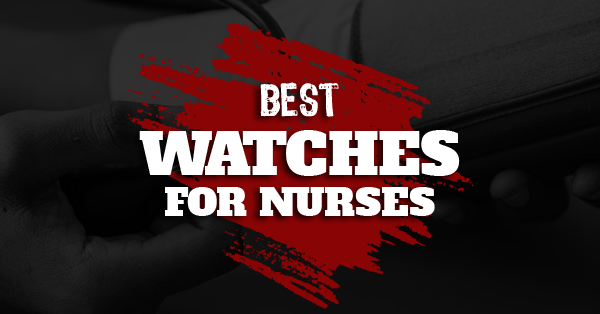 Luckily for you, you’re already reading this best watch for nurses list. We’ve curated the top watches best suited for the job. The models come in a wide price range so you’re bound to find one that fits your budget. The Timex brand has long been known in the watch industry with a very long watchmaking history that goes all the way back to the 1850s. With this experience and the expertise they gained from it, the people at Timex has mastered their craft. It’s not surprising then that the Timex Women's Weekender 31mm Watch is included in this best nurse watches 2019 list. The Timex Women’s Weekender watch does not really attempt to dazzle you with high tech wizardry and functions you might not even need. Rather, it entices you with its simplicity and elegance with its classic styling. But that does not mean it’s not up for the challenges nurses face every day. It is highly useful not only for keeping track of time but also for taking various patients’ vitals such as pulse rate or respiratory rate as it has a very visible second hand. You can even easily tell the time at a glance even in the dark because the watch sports an Indiglo Light-Up Watch Dial, a useful feature for your night shifts. Moreover, the watch also is also marked in such a manner that you’ll be able to easily convert the time to the 24-hour military format. Every nurse knows that their working environment is teeming with germs, it is where all sick people congregate after all. Thus, frequent hand washing is a must for health reasons. 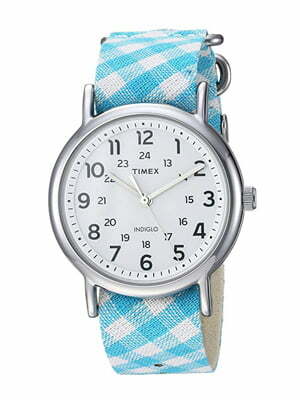 Fortunately, the Timex Women’s Weekender is built with these conditions in mind. You can wash your hands including your timepiece as frequently as you want without worrying that the water might affect its function. This watch is water resistant up to 30 meters and is rugged enough to survive brief immersion in water. Just a warning though – the manufacturer says it's not suitable for swimming or bathing where it will be immersed in water for longer periods of time. Okay, when we mentioned that it's rugged, we meant that its tough enough to handle frequent water splash but we did not mean that it looks unpolished. Au contraire, its one of the most elegant watches out there which is a big surprise considering its price. And for the fashion-conscious nurse, you can even easily change its strap with one that matches your mood or attire because it’s a slip-thru. Previously known as a pocket calculator manufacturer, Casio started its watchmaker business more than four decades ago in 1974. Since then, the company has produced exceptional timepieces that showcased the brand’s commitment to quality and fine craftsmanship. The Casio LRW200H-7BVCF Women’s Watch is no exception which qualifies it to be included in this top watches for nurses list. This is an analog timepiece for women with a smart, classic design that oozes with timeless appeal. While its aesthetics is unquestionable, the surprising part is that it works just as well as the perfect timepiee for the demanding lifestyle of a nurse. Accidentally water splashes can be considered a part of a nurse’s daily routine. After all, when you are dealing with multiple patients, you need to wash your hands a lot of times during the day to prevent the spread of viruses and harmful microbes. Normal watches might not be able to take this routine but, for the Casio Women's Dive Series Sport Watch, it is nothing at all. That because this particular timepiece was created for the water. Amazingly, it is water resistant up to 100 meters. In fact, it can even handle snorkeling and swimming so an occasional water splash or two. You can even watch your entire arm while wearing the watch or take a bath without taking it off and it won’t be an issue. It has that pure elegant look with its all-white casing and face being highlighted by the pastel-colored 12-hour and the smaller 24-hour indices. It also features a bi-directional bezel and round dial while its 33 mm case is made out of resin with a mineral dial window. While it is marketed as a dive-inspired watch, it will feel right at home on land as it does on the water. And besides, the Casio Women’s LRW200h-7BVCF is the perfect accessory to use for those days when you're just feeling a little sporty. The Casio Women's LRW-200H-2BVCF Stainless Steel Resin Band is another excellent choice for nurses and certainly a fitting candidate for the best watch for nurses title. Of course, we can’t really expect anything less from Casio, one of the well known global brands in the watch industry. Just like the previous product, the LRW-200H-2BVCF Stainless Steel is water resistant up to a depth of 100 meters. This makes it suitable even for swimming and snorkeling so wearing one to nurse duty won’t be a problem for this watch. This watch features an analog display with a bi-directional bezel design that speaks of its diving affinity. Meanwhile, 12-hour and 24-hour markers can clearly be seen against their white background so nurses won’t find it hard to tell the time. With its luminous hands, telling the time is easy even in the dark. There is a small date window located at the 3 o’clock mark. 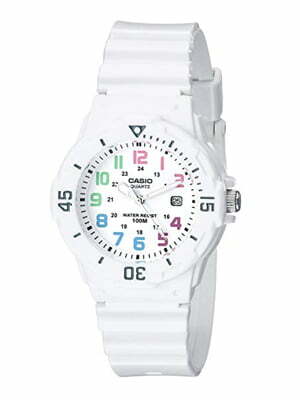 This Casio watch model is so similar to the previously discussed Casio Women's LRW200H-7BVCF Dive Series Sport Watch. In fact, even the prices of the two watches are the same. The only obvious difference between the two is the color. The Casio Women's LRW-200H-2BVCF Stainless Steel Watch’s bezel is colored pink as opposed to the all-white color scheme of the other model. Another difference is that this is slightly larger with its case measuring at 38.9 millimeters. 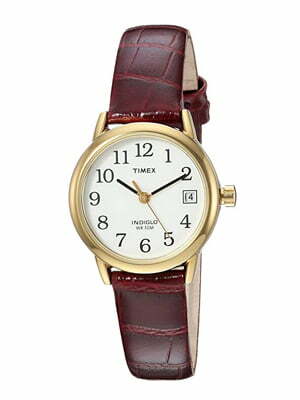 One glance and the ladies will surely fall in love with the timeless beauty of the Timex Women's Indiglo Easy Reader Quartz Analog Leather Strap Watch with Date Feature. It’s the descendant of the company’s bestseller back in the 1960’s so you’ll know right away that this is one durable yet elegant looking watch. Despite its classic design, this watch fits perfectly with the lifestyle of those in the nursing field so we have included it here in our list. The watch’s face is simple and, with no details to distract the eyes, it’s very easy to read the time. This is important for carers as nursing work could get pretty busy sometimes that they only have a moment to take a glance at their watches. This simple, clutter-free design works best and, coupled with the easy-to-read white hands with full Arabic numerals, makes this watch perfect for nurses. Nurses usually shuttle back and forth between patients during their shifts. This requires them to wash their hands multiple times throughout the workday to keep germs and viruses from spreading. Obviously, watches will unintentionally get splashed at times which makes some models unsuited because they might malfunction. But not the Timex Women's Indiglo Easy Reader Quartz. The watch is water resistant up to 30 meters and can withstand splashed and even brief immersions in water. Now, this is a pretty helpful feature for caregivers so that don’t have to be extra careful during those hand washing procedures. The ability of a timepiece to tell time even at night is important for especially for night nurses. Thankfully, this timepiece from Timex features Indiglo lighting so reading the time is not a problem even it a pitch black room. Most ladies would want something more out of their watches than mere functionality. Thankfully, this timepiece won’t disappoint them. The watch’s classic styling exudes a simple yet understated elegance that speaks of the refinement of its user. Don’t worry, the watch will look just as good with your formal dress as it does with your nursing uniform. 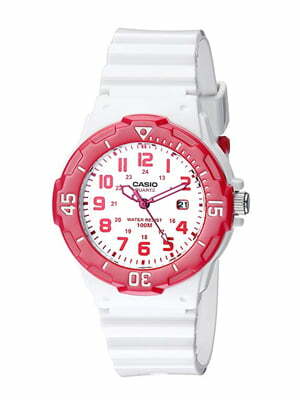 Casio has been known for coming up with affordable watches that are extremely functional. The Casio Women's LQ139A-1B3 Black Classic Resin Watch lives up to the brand’s image as it is packed with the useful features that a nurse’s watch should have minus the frills. Coupled with its very low price, we’ve included it in this top watches for nurses list. 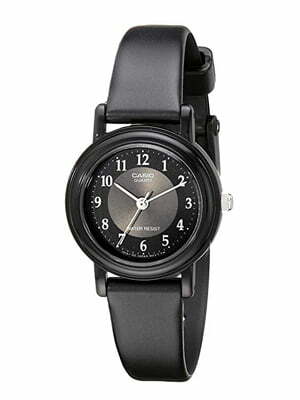 Design-wise, Casio opted for simplicity in the LQ139A-1B3 Black classic resin watch. It is basically a round watch that uses quartz movement (find more great quartz watches here) with analog display. The 22 mm case is made out of resin, and enclosing the hands and watch’s face is a resin glass dial window. It also sports a black resin band with buckle closure. The advantage of this simple design is evident in one glance – you can immediately tell the time as the hands and the hour markers are extremely easy to read. This is important for busy such as nursing attendants who might only have a moment to spare to check their watches. One downside for this watch is that it is not exactly waterproof. So swimming, taking a bath or snorkeling while wearing this watch is out of the question. However, other activities that might expose the timepiece to occasional splashes of water should be fine, its mechanism is enclosed in a resin casing after all. While it is not guaranteed by the manufacturer as waterproof, buyers who have used the watch attest that it's not that delicate as it sounds. They’ve tried even washing the dishes while wearing the watch and it was not affected in the slightest. So far, we’ve covered watches that, while perfect for nurses, were never specifically designed for the medical profession. 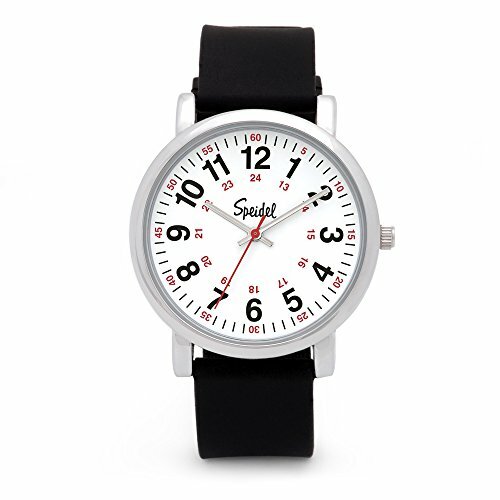 If you have ever wondered what a watch that is specifically made for nurses and doctors looks like, you’ve finally found it in the Speidel Scrub Watch for Medical Professionals. It sports features that are extremely helpful for nurses such as the easy to read hands specifically the time piece’s second hand that we did not hesitate to include this in this best watches for nurses list. At first glance, you’ll immediately know that the watch was designed so that it's easy to read. The 24 and 24-hour markers are large enough and contrast perfectly with the white background. Meanwhile, the 3-hand quartz movement especially the second hand -- made very visible as it is in red – is perfect for nurses. It’s very easy to track the movement of the highly visible red second hand which makes it very easy to get patients’ vitals like pulse rate. The manufacturer knows that nurses tend to wash hands more often than other people due to the nature of their job. 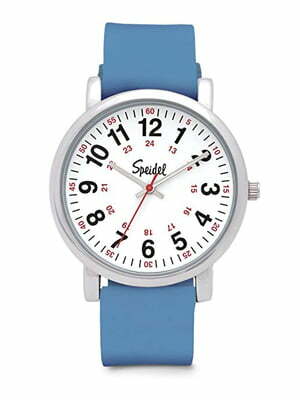 The Speidel Scrub Watch works around this problem by making the watch water resistant to depths of up to 30 meters. This means that washing the entire arm while wearing the watch won’t damage the timepiece. On that note, the silicone band not only provides comfort even with prolonged use, it also makes the watch very easy to clean. If you want to color coordinate your watch with the color of the clothes you are wearing, it can easily be done with the Speidel Scrub Watch for Medical Professionals. The straps can easily be replaced and there are seven strap colors to choose from such as Pink Silicone, Black Silicone, White Silicone, Teal Silicone, Blue Silicone, White Leather and Stainless. Easy to watch and swap at a moment’s notice, these are silicone watch bands best for nurses and doctors. In terms of wrist size, the watch strap can be adjusted to its minimum circumference of 6.7 inches to its maximum of 8.3 inches. This makes it suitable for both female or male nurses whether they are ER nurses or ICU nurses. 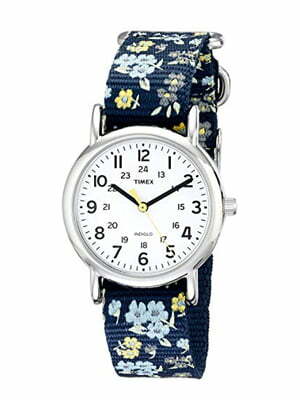 We’ve already included the Timex Women's Weekender 31mm Watch is included in this top nurse watches round-up. However, some ladies might find the 31mm to small for their taste, hence, we’ve also included the Timex Women's Weekender 38mm Watch for those who prefer a bigger watch face. Just like its smaller sister, the 38mm watch is simple yet elegant with its classic design. It might not have the high tech features of some smartwatches but it still gets the job done even without the frills. While simple, the watch’s highly visible seconds hand is perfect for keeping track of patient’s vitals such as respiratory or pulse rate. For busy nurses, this simple design is actually a plus – they’ll be able to tell the time right away in just a single glance. Checking the time is also easy even in darkly lit hospital rooms during nurses’ night shift thanks to the watch’s Indiglo Light-UP Watch Dial. 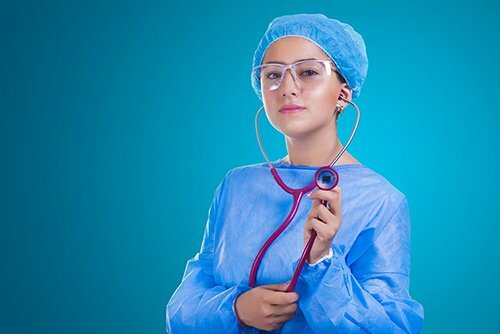 Nurses are there to assist patients on their way to recovery and it’s inevitable that sometimes, they’ll come into contact with viruses and harmful pathogens. This explains why nurses need to frequently wash and sanitize their hands to keep viruses at bay and prevent them from spreading. Regular watches might not be able to survive these frequent water splashes but, thankfully, Timex Women's Weekender 38mm Watch is not one of them. The watch is water resistant up to 30 meters and splashes of water is a non-issue. Ladies are usually fashion conscious and will often color coordinate their clothes and accessories. That’s not a problem for this watch at all. With its easily detachable strap and the availability of a variety of strap options, changing your strap’s color to compliment your mood or attire would be very easy. Unfortunately, there is no extra strap included in the package so you’ll have to order for one. 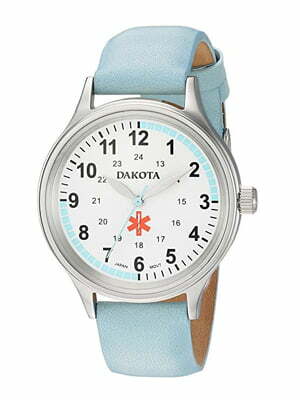 The Dakota Leather Casual Women's Watch can be found in most “best nurse watch” lists, which is a testament to its functionality as a nurse’s watch. It is packed with useful features that are specifically designed to assist carers and, coupled with its cool appearance, we’ve decided to include it in this list as well. For instance, carers in nursing who own the Dakota Leather Casual Women’s Watch love how the seconds markers change colors in 15-second segments, essential dividing the watch’ face into four. Called quadrant ring, it makes it very easy for nurses to use the watch in measuring pulse or respiration rates. For charting and documentation, carers who do nursing work will find the 24-hour markers extremely useful as it can easily tell at a glance the military time (if you're looking for more military watches, click here). In addition, the numbers are all easy to read which is also a plus. This is a watch for the ladies after all so it should be aesthetically pleasing. This watch’s strap is available in a variety of colors so you’ll likely find one that matches your scrub perfectly. Now that you’ve seen our ultimate watches for nurses, you’ve now arrived at the most crucial step – deciding which watch to buy. But before you do that, here are a few important factors to consider which will help you make a better informed buying decision and choose what type of watch is really perfect for you. This is usually a personal preference but there are pros and cons to each choice. Wristwatches are obviously easier to use but after getting wet due to frequent handwashing, they can easily breed microorganisms. Lapel watches can just be pinned on you uniform which eliminates contact with wet surfaces but they are a bit inconvenient to use especially when taking patient vitals. Again, there’s no right and wrong choice as it’s a matter of preference. However, a lot of nurses would prefer analog watches when taking a patient’s pulse rate because it's easier to keep track of the second hand’s movement with a FOB watch. With frequent handwashing, it’s important for wristwatches to be water resistant so they won’t malfunction easily. Its preferable for a timepiece to have a backlight or glow in the dark feature. This is because some patients may turn off or dim the lights in their rooms so you can easily check your watch unless it has this function. With the recent development of wearable technology, some digital watches are now packed with additional features. Aptly named smart watches, they can receive and answer messages by voice, perform fitness tracking and run a host of smart watch-specific apps. With increased functionality, however, they tend to be a bit distracting and definitely not everyone’s cup of tea, even when you're fit to wear them. If you are the type who tend to drop things or accidentally bump your timepiece to walls or table edges, you might want to get a timepiece with the superb ability to endure drops and sudden mechanical shocks or vibrations. The Casio GShock series is known for this feature and the best part is they’re very affordable. Ultimately, the price will be one of the most important factors in your buying decision. Even if you are shopping on a budget, you don’t have to compromise quality and design over price. A good example of high-quality, fashionable yet affordably-priced timepieces are the various lines of the Fossil brand. With enough effort, you’ll surely be able to find a timepiece that offers the perfect balance of price and quality. Watches worn by carers need to be cleaned regularly so they won’t become breeding grounds for germs and microbes. With this in mind, choose models that are extremely easy to clean such as the Prestige Medical Nurse White Scrub watch, which has a white, waterproof resin case that is so easy to wash.
We’ve given you a short list of what, in our opinion, the best watches are for nurses. Of course, you might disagree with some of the watches and that’s okay. After all, you might have a specific preference or a reason for wanting something else. However, we hope that the list is helpful to you in some way.